Most people would probably agree that when they start to feel a bit stressed out they tend to reach for the biscuit tin, or something else they find comforting in the food cupboard. This seems to be a problem for rather a lot of us, and unfortunately those added calories we binge on during those stress binges just leave us feeling worse than we did before. Anyone who is familiar with stress eating knows that it isn’t about hunger; it’s really about our emotions. There is an emotional void within, or something disturbing us that leads to eating, in an attempt to soothe that issue. While there might be some people that find themselves put off of food during stress, there are so many more that seek comfort in it. It’s happens to be unfortunate that it is never broccoli or celery sticks that we crave; it’s the unhealthy options that always seem to be in the spotlight. Long term stress causes the body to release cortisol, and this happens to be the hormone that triggers our appetite. As it happens cortisol also increases our cravings for foods that are generally sweet, salty, and high in fat, because those are the types of food that result in satisfaction and big bursts of energy. There are times when stress eating isn’t intentional, but instead we reach for an item of food that gives us pleasure. Having an episode of stress affects how we choose our food, how our body digests it and in turn absorbs the nutrients. Unhealthy choices contribute to higher levels, and those stress levels contribute to choosing the wrong types of food. If any of this is sounding very familiar to you, then by knowing what is happening you are well on your way to sorting out the problem. Developing poor sleep habits can contribute to stress and emotional eating. It’s important to maintain a regular sleep schedule so you can get at least seven to eight hours every night. Set a bedtime and stick to it, and set your alarm for the same time every morning, even if you don’t have a lot on the next day. Wagner College’s Department of Psychology led a study that found just how sleep duration and quality can impact on our likelihood to stress eat. Stress eating is often mindless so when you start to feel a craving give yourself time to make the right decision, rather than immediately grabbing a packet of biscuits, a bag of chips or a tub of ice cream. If you know you’re going to be susceptible to a bit of stress eating, then you should avoid keeping any “comfort foods” in the house. If you do have them around, rather than keeping large bags of snacks available, portion them into individual servings. Alternatively, keep healthy snacks on hand, like fruit, celery, carrot sticks and hummus, and for more severe cravings you can turn to plain popcorn, baked chips, and frozen yogurt. According to the Anxiety and Depression Association of America doing some form of every day is a great way to reduce stress levels. 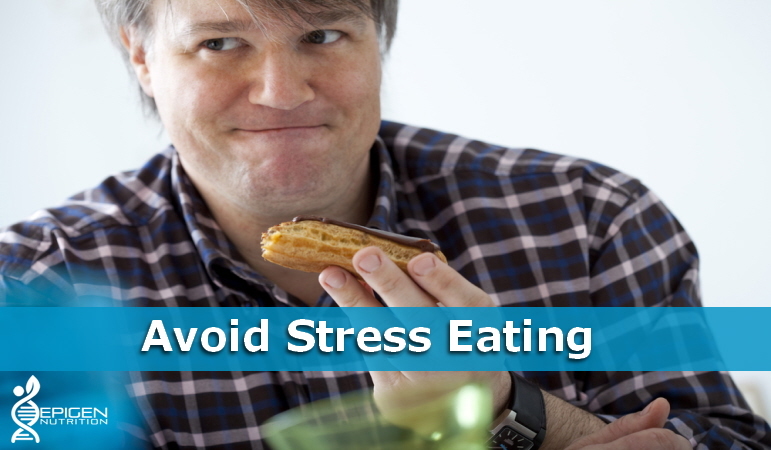 Reducing stress is great for your energy levels and mood, which in turn will lower your need for stress eating. According to a study from the University of York, meditation is effective in reducing stress eating. It helped to bring down stress levels, as well as encouraging participants to become more mindful about what they are eating. It helps prevent the impulse we feel to grab unhealthy snacks. Meditation seems to be one of those practices that can actually provide you with an endless list of benefits for mind, body and spirit. Unfortunately comfort eating gives most of us that soothing feeling and that kind of starts to happen at a very young age. So there is no need to beat your-self up over it. Not everyone is triggered into stress eating by the same things so it’s important that you recognize what leads you to stress eat. Give yourself a break and focus on what triggers your stress getting to the root of the problem will help stop the need to stress eat. Previous articleIs Your Body Vitamin Deficient?